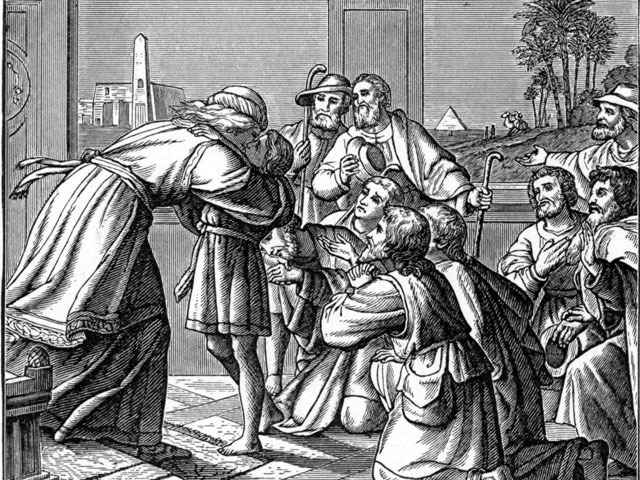 When Yaakov (Jacob) meets his son Yosef (Joseph) after seventeen years of separation the Torah states, “And he wept on his neck” (Genesis 46:29). Since the sentence speaks of only one individual crying, “and he wept,” who is the Torah referring to? Was it Yaakov or was it Yosef who cried? One could argue that it was more likely that Yosef did the crying. After all, Yosef must have been filled with feelings of deep regret. Regret for having stirred his brother’s jealousy through his dreams and regret for having failed to contact his father during the years of separation. On the other hand, Yaakov must have also felt deep regret which may have prompted his crying. Yaakov, who grew up in a family wrought with friction due to his parents’ playing of favorites, should have known better than to play favorites himself. His favoring of Yosef eventually led to Yosef’s sale. Yaakov also made the mistake of sending Yosef to his brethren to make peace with them. It was this plan that backfired and led directly to Yosef being sold to Egypt. Tears of remorse would have been understandable. There is another approach, one that doesn’t emphasize tears of regret but rather tears of emotion. Here, the classical commentaries disagree. Rabbi Samson Raphael Hirsh argues that Yaakov, who lived isolated in one place for twenty two years, was immersed in the pain of the loss of his son. When meeting Yosef he doesn’t cry because “his tears had long since dried up.” When the reunion finally takes place, Yaakov has no more tears left. Joseph however, had experienced “so many changes of fortune” since he left home and did not have time to dwell on his homesickness. When he meets his father, all the feelings that had been suppressed, rose to the surface. His crying showed the sudden rush of this pent up emotion. When addressing this text, I often ask my students: “How many of you have seen your mother cry?” Invariably, many students respond in the affirmative. But when I ask the same about their fathers, very few hands are raised. Somehow, we mostly associate crying with women and not men. This should not be. Indeed, the Torah never mentions Avraham (Abraham) or Sarah, Yitzchak (Isaac) or Rivka (Rebecca) crying before their children. Yaakov is the first. His tears reflect an openness of emotional love that allows a parent to cry freely before his / her child. No wonder we are called the children of Yaakov (b’nei Yaakov) or the children of Israel (Yisrael), Yaakov’s additional name. Built into our personal lives and the lives of our nation, are profound and deep tears. They are reflective of deep emotional feelings. The expression of such feelings should not be denied, but encouraged. Just as there are times where joy and smiles should be shown to everyone, there are times that almost demand the flowing of tears. Blessed are the children who have the privilege and chance to glimpse into the depths of their parents’ emotions and witness a spontaneous flowing of tears.